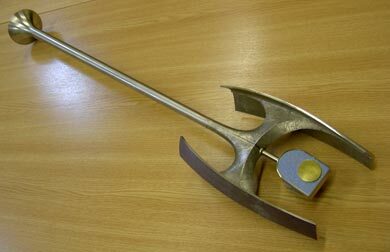 The Open University Mace is an example of the early use of titanium for decorative purposes in an area where precious metals were normally used and had been for hundreds of years. 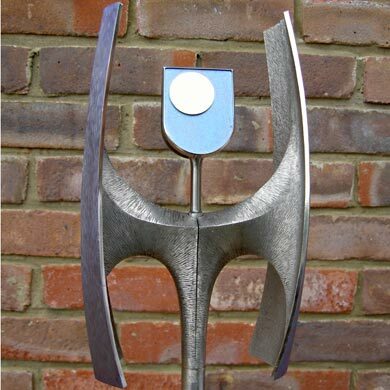 The decision to use titanium was taken in 1970 when Eric Clements, then Head of the School of Industrial Design at Birmingham College of Art, was commissioned by Imperial Metal Industries (IMI) to design a mace to be presented to the Open University. Titanium, although discovered in the eighteenth century, was only isolated as a pure metal in the early twentieth century and not commercially produced until the 1950s. It combines the light weight of aluminium and the strength of steel, properties which made it an ideal material for aerospace. Titanium also exhibits good corrosion resistance due to the formation of a tough, stable oxide layer on the surface of the metal which protects it from further attack. The development and manipulation of the thickness of this oxide layer produces a range of interference colours similar to the effect of petroleum on a wet road. In the mid-1960s the silversmiths and jewellers at the Birmingham College of Art were encouraged by IMI, a division of ICI and UK producers of titanium, to explore the decorative potential of this new metal. The jewellers were most attracted by the colour possibilities of the material and procedures were developed, in collaboration with IMI, for heating or anodising titanium to produce a wide range of colours. By 1970 Eric Clements was a designer of repute in many areas of metalworking, the winner of many design competitions and the recipient of design commissions for plate from Universities around the world. He made few pieces himself but worked with others to create finished objects from his designs. The creation of the mace is an example of how this collaboration worked. A full size wooden model was produced from Eric Clements design drawings by a retired automotive model maker. The model was then used by IMI to create the titanium parts. The head of the mace was cast and the shaft was turned from titanium bar. These processes required industrial production conditions as existing silversmithing workshops, although capable of working to the scale required, did not have the facilities to create the inert atmosphere that is needed for the casting of titanium. The mace was assembled and finished at Birmingham College of Art by Hamish Bowie and Sidney Perkins. Perkins carved the coat of arms and shield, which are set in the base of the shaft. 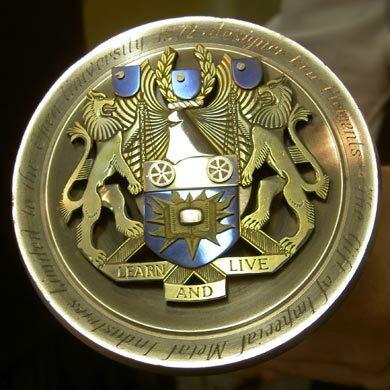 The colouring, by anodising, of the outer surface of the head of the mace, the symbol of the OU in gold and blue and the elements of the coat of arms was carried out by Bowie. Hughes, G, Explosion, Catalogue of the 650th Birthday Exhibition of the Worshipful Company of Goldsmiths, Worshipful Company of Goldsmiths, London 1977, p.81. Hunt, Terry (ed), Finely Taught Finely Wrought, Birmingham School of Jewellery, Birmingham1990, p.65. Clifford, H, Goldsmiths’ Review 2000/2001, Worshipful Company of Goldsmiths, London 2001, p.20.